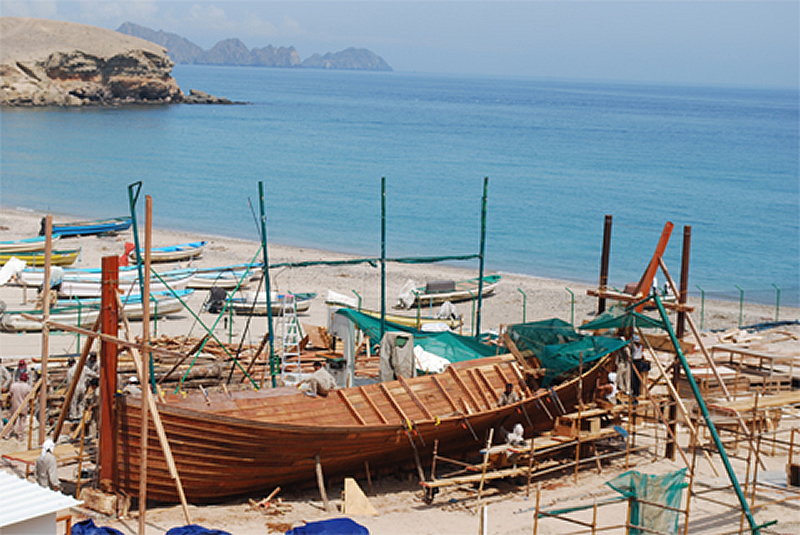 On the beach in Oman a new ship was built. It is the Jewel of Muscat and it is a copy of an ancient trading ship. The Jewel of Muscat is based on the study of old ships and a shipwreck discovered in 1998. Buoyancy – they can float. This can be due to the materials they are made from or the shape of the ship, or both of these together. Stability – they do not tip over easily. Ships have heavy weights called ballast in them to keep them steady in the water. Propulsion – they can move and can be steered. When a ship floats it pushes aside (displaces) water to make room for itself. The water in turn pushes back. The more water a ship displaces, the more force there will be pushing back on the ship. Ships and boats can be made out of all sorts of materials, even heavy materials, but if they are not shaped correctly they will sink. The Jewel of Muscat has buoyancy. 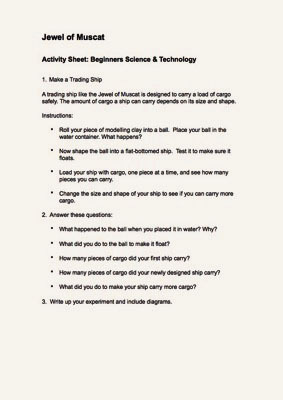 It floats because of the materials and the shape of the ship. The Jewel of Muscat has stability because it has a ballast of lead ingots (blocks of metal) and bags of gravel stacked low down inside the ship. The Jewel of Muscat has propulsion. It will move with the wind in its sails while a rudder will help to steer.